Conflict began after Riel drafted the Bill of Rights. 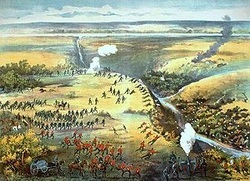 The fist conflict occurred in Duck Lake, it also occured in Fish Creek and Batoche. The rebellion was concluded with 175 killed Metis, Dumont fled to the States, and Louis Riel suffered death penalty. View North-West Rebellion and over 3,000,000 other topics on Qwiki.